High Quality Content by WIKIPEDIA articles! High Quality Content by WIKIPEDIA articles! 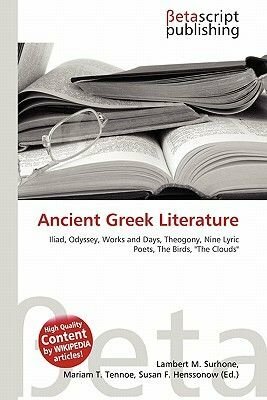 Ancient Greek literature refers to literature written in the Ancient Greek language until the 4th century AD.This period of Greek literature stretches from Homer until the 4th century BC and the rise of Alexander the Great. Alfred North Whitehead once claimed that all of philosophy is but a footnote to Plato. To suggest that all of Western literature is no more than a footnote to the writings of ancient Greece is an exaggeration, but it is nevertheless true that the Greek world of thought was so far-ranging that there is scarcely an idea discussed today not already debated by the ancient writers. The earliest known Greek writings are Mycenaean, written in the Linear B syllabary on clay tablets.